New York. Where to begin? It is a crazy, crowded, loud cosmopolitan place. Nathan and I spent four days there and in those four days we came to appreciate the suburbs we call home. 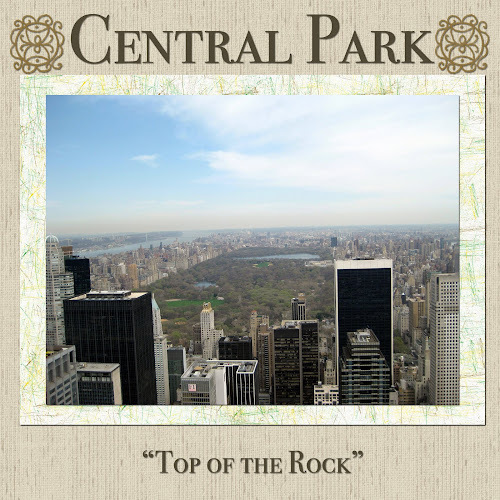 Everyone should experience NYC once; there is no place like it. 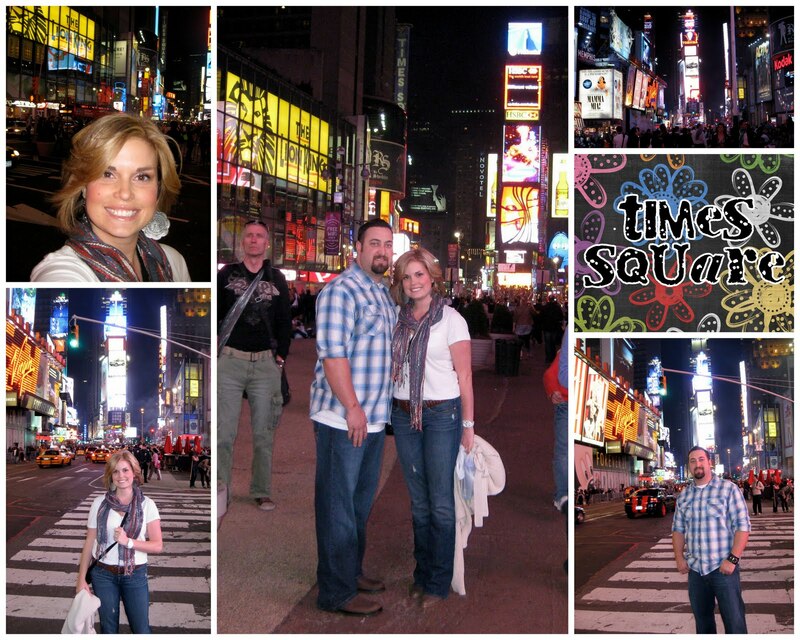 The first night we got there we went to Times Square, which was a few blocks from our hotel. 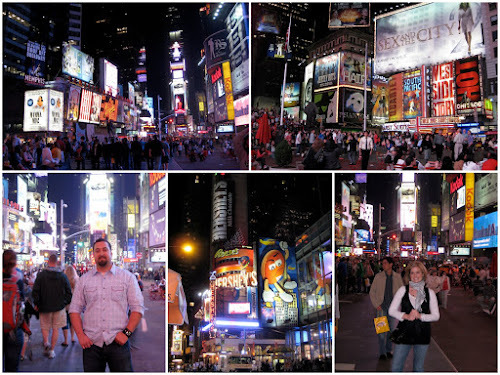 We compare Times Square to City Walk at Universal, except it is City Walk "on crack." It is plastered with illuminated billboards and advertisements and lined with shops and restaurants. 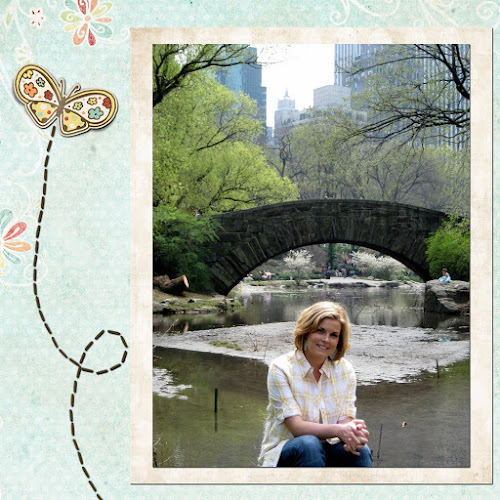 People are EVERYWHERE--that goes for all of NYC for that matter. The next morning we walked a few blocks to Pick a Bagel. 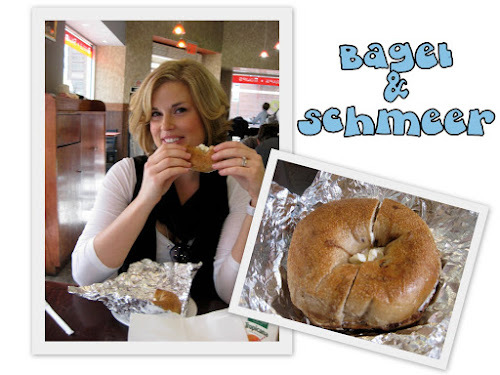 I wanted a New York bagel and schmeer (Nathan hates that word). I got blueberry, Nathan plain, with orange and grapefruit juice. 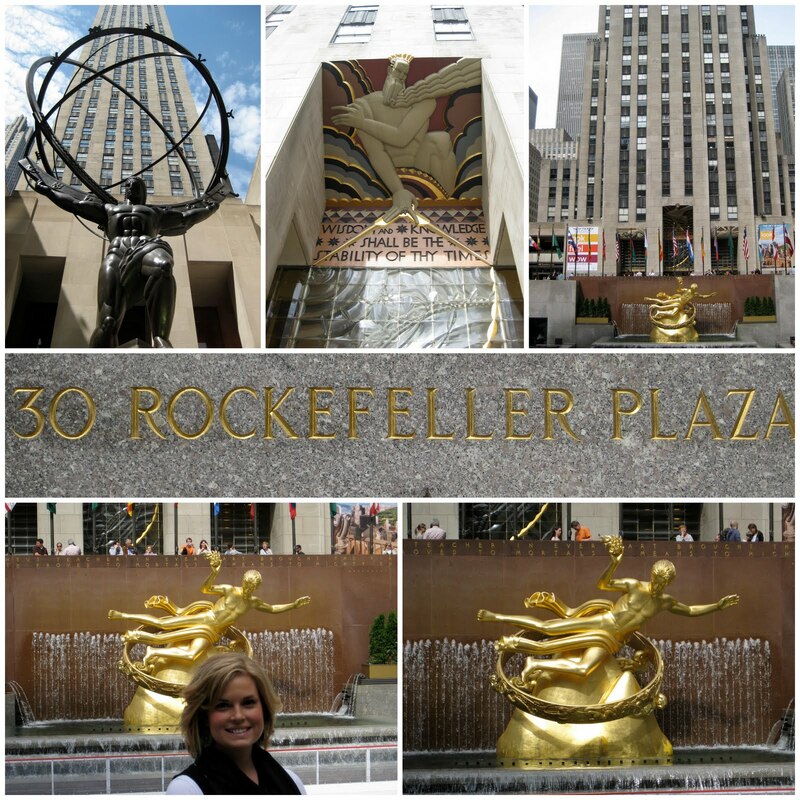 We then walked over to the Rockefeller Plaza. I had to take a picture next to Dean & Deluca because in one of my favorite TV shows of all time, Felicity, she worked in this shop. I loved all the references to Greek Mythology in NYC. At 30 Rock there is a large statue of Prometheus the creator of mankind and stealer of fire. He gave man knowledge and ingenuity. We went to the top of 30 Rock , called "Top of the Rock" where we had a view of most of NYC. 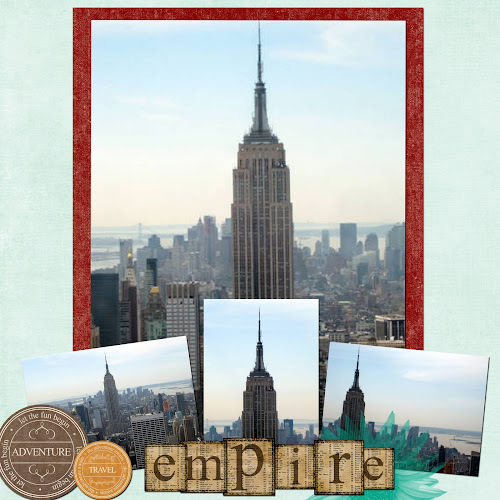 We did this instead of the Empire State Building because we can see Central Park and the Empire State Building itself. 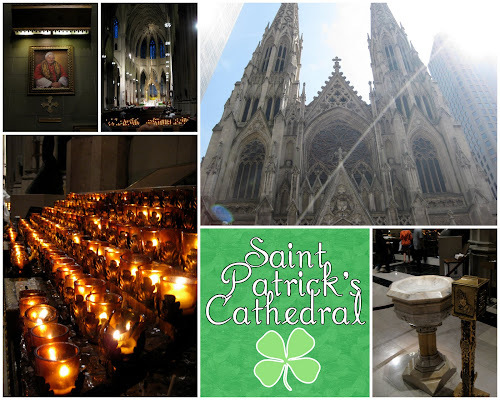 Across from the Rockefeller Center was the Saint Patrick's Cathedral. It was very ornate and beautiful. There was a service going on which was interesting. 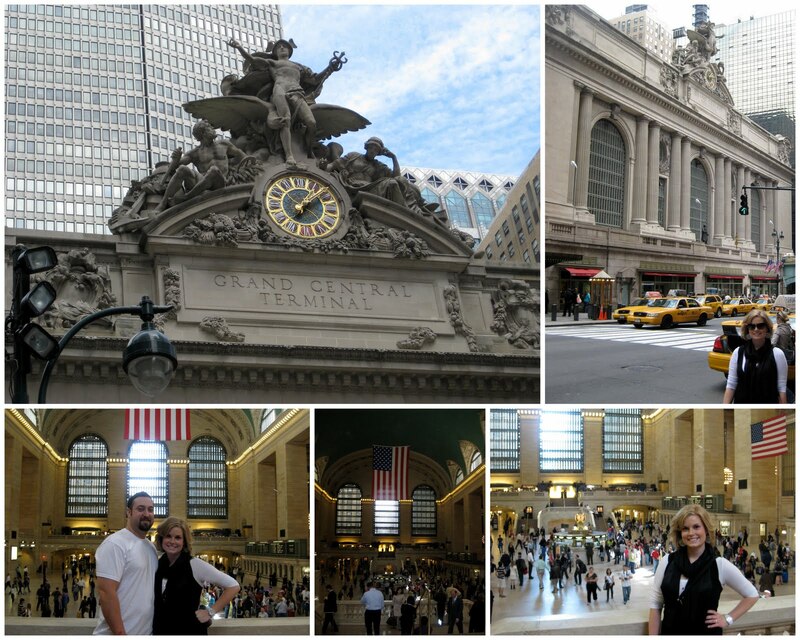 We the went to the Grand Central Station. Again I loved the allusions to Greek Myth. Hermes was on the front of the building which was appropriate seeing as he is the Greek God of travelers. 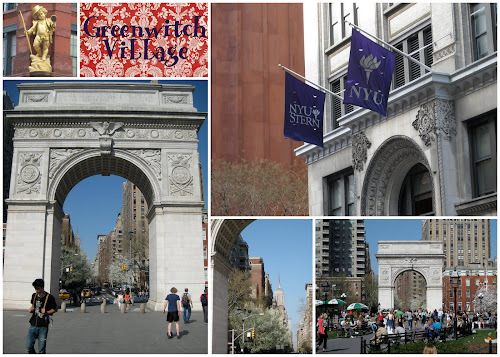 After lunch, we went down to Greenwitch Village and NYU. We liked that area. It was very eclectic. Washington Square was thriving with people studying, singing, dancing, kissing and relaxing. 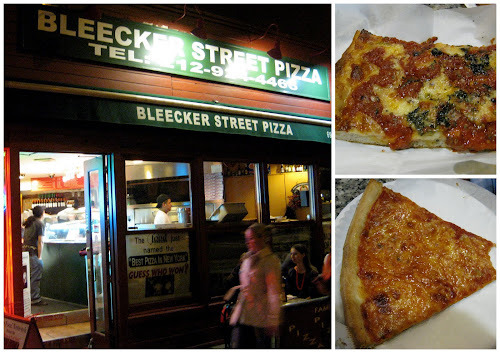 That night for dinner we went over to Bleecker Street in the Village and ate at Bleecker Street Pizza. It was rated the best pizza in NYC and raved about by Jimmy Kimmel, so we had high expectations but were sadly let down. 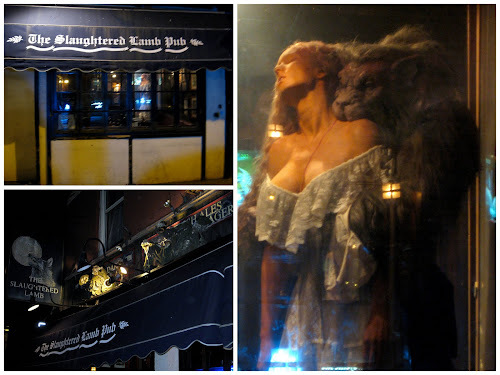 A British Pub that was so interesting. It was all Werewolf decor with skeletons and stuff. The mannequins in the window was seriously crazy! Waiting for the Subway. Nathan is so serious. For dessert we went to Serendipity. Ever since I saw the movie Serendipity, I've wanted to go there. They are famous for their Frozen Hot Chocolate, which was yummy. 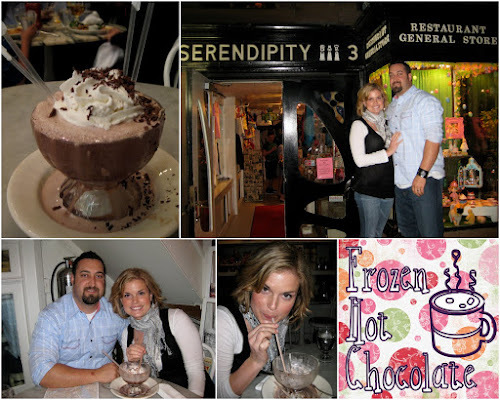 Serendipity is a quaint little place--super cute. Wednesday we started our day walking through Central Park. It was only a block from our hotel. Central Park was a little piece of paradise in a city of chaos. It was peaceful and picturesque. 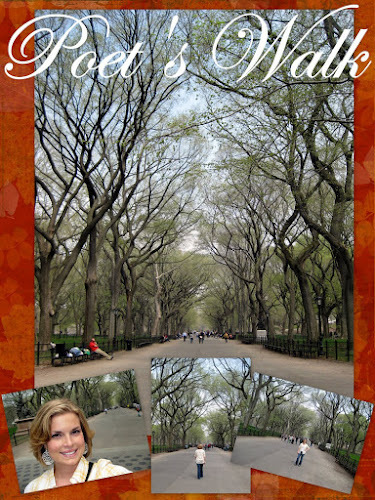 In our apartment, we have a black and white photo of Poet's Walk Central Park, so we were excited to see it for ourselves. it is lined with bronze status of famous poets with benches upon which people can sit and read. 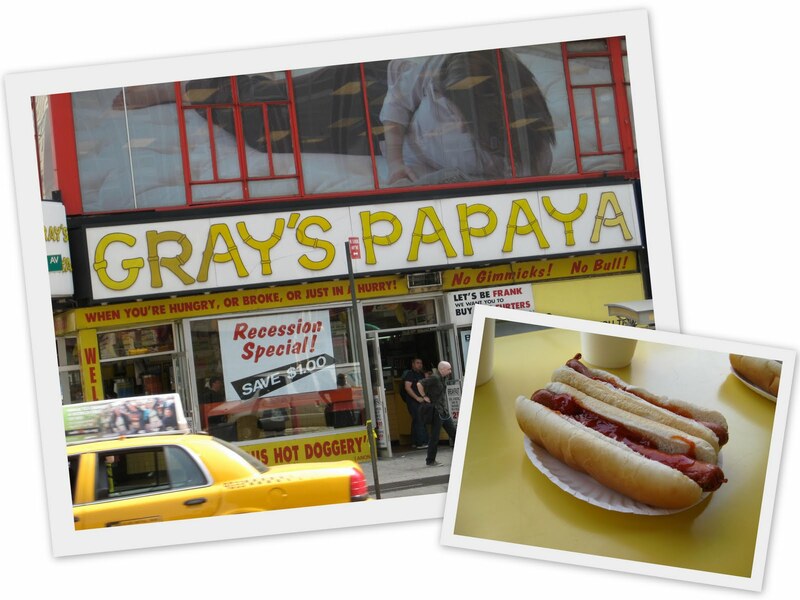 For lunch we went to Gray's Papaya for the famous hotdogs. They have a "Recession Special" which includes 2 hotdogs and a drink. I got this with their popular papaya drink, Nathan got the pina colada, which we both preferred. Later that day, we went out to the Brooklyn Bridge and walked to the first arch. Again, there were tons of people. On our last full day there, we again started the day walking through the Park. 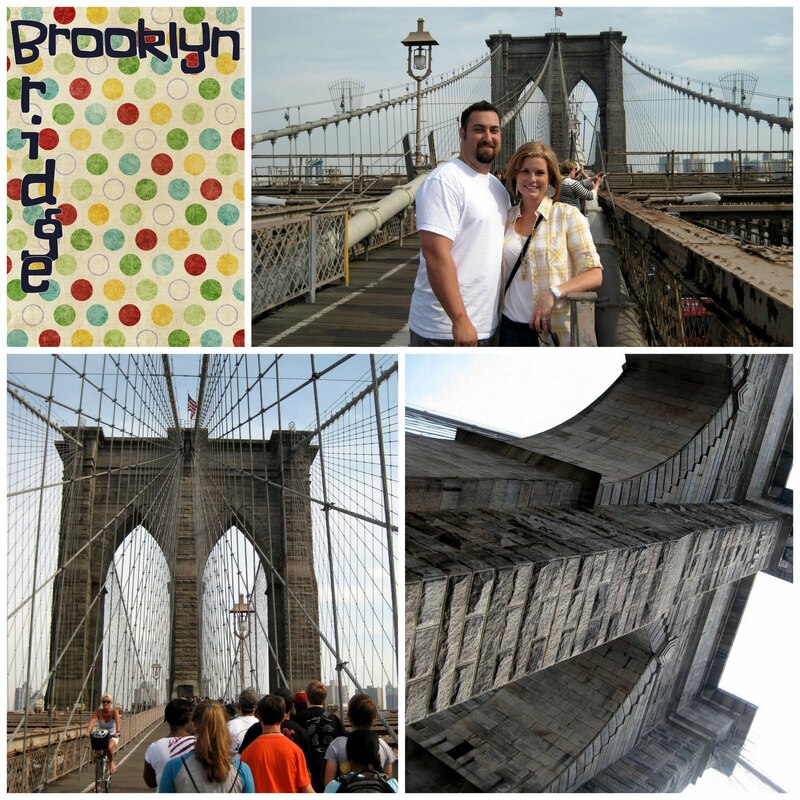 We took lots a pictures of the scenery, so be sure to watch the sideshow on this blog. 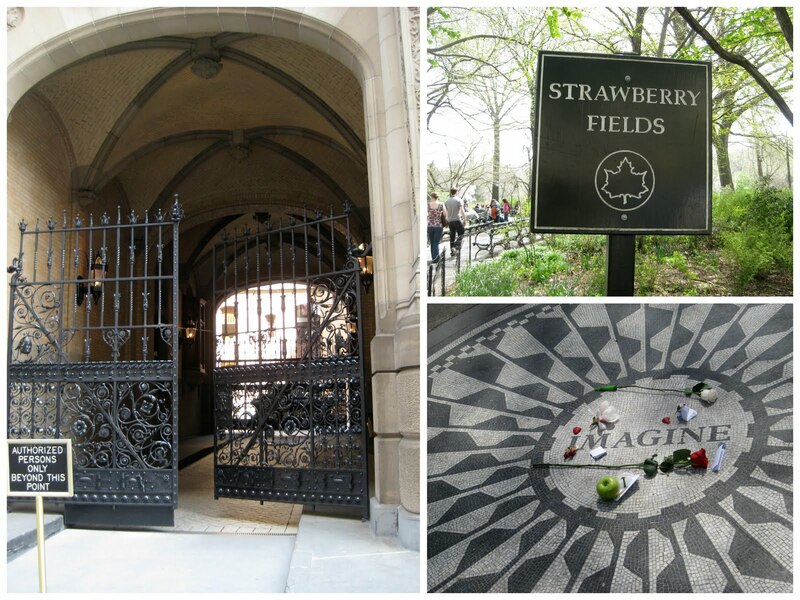 This is Strawberry Fields, which by the way has not strawberries, where there is a tribute to John Lennon. Across the street is the Dakotas where Lennon lived and died. We went up to the Upper East Side to the Metropolitan Museum, and I am so glad we went because it was rich with Greek sculptures. My favorite part were the sculptures of Hercules. These are sculptures I have only seen on the internet when I do a google search for Hercules pictures, so they were amazing to see in real life! You can always recognize Hercules by his lion cloak. In his youth, he wrestled and killed a lion, skinned it and adopted it as his cloak. The Greeks always depicted Hercules weaning it. In the picutre above it is draped over this arm, and in the one below you obviously see its paws crossed across his chest and over his head. For lunch we went to a third pizza place. This one was a recommendation from a friend. The pieces were HUGE! Bigger than my head. That evening we went down to look at the Statue of Liberty. We only look at it from across the bay. We sat in Battery Park for a while and relaxed. We then decided to go see a movie. We were tired, our feet ached and sitting down for and hour and a half sounded nice. 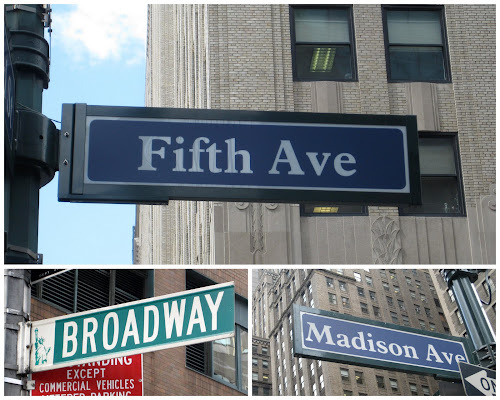 On the way up to Times Square, we discussed how we weren't able to see Madison Square Garden, and I said "I guess we can't do everything." We bought our tickets and had 45 minutes to kill, so we left the theater to find a snack and that is when an NYPD Cop came up to us and started asking us strange questions about our movie; things like if we can see later show and such. He then asked Nathan if he likes hockey, to which Nathan replied "Yeah, I've been to some hockey games back in LA..." Finally, the cop told us he had tickets to the Ranger Hockey Game and offered to give us them. The game was at the Madison Square Garden! We thanked the cop, quickly got a refund for our movie ticket and shot downtown. 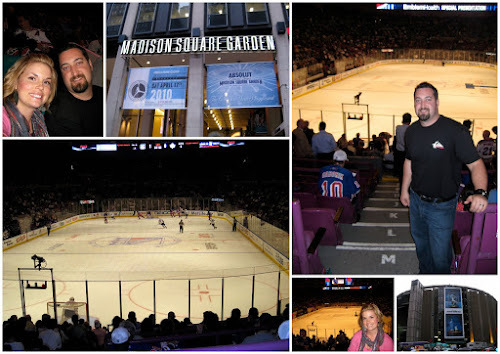 So after all, we did see Madison Square Garden. Nathan was super excited. 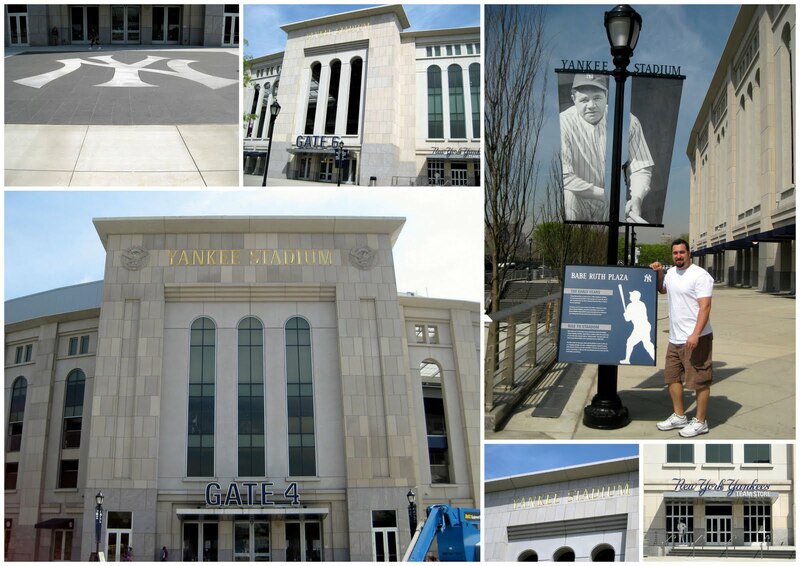 On our last day, before leaving for the airport, we went up to the Bronx to see Yankee Stadium. 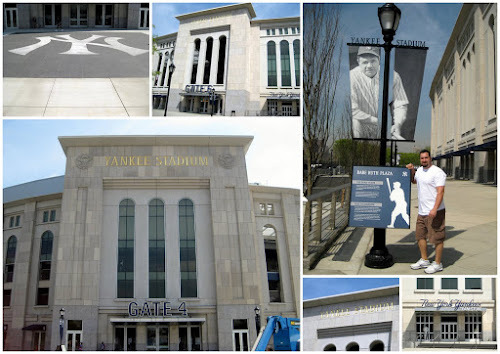 Sadly, the Yankees were in Boston, but we walked all around it. The Yankees are Nathan's favorite baseball team so it was important that we went up there. There was 90 degree weather in NYC! We planned for cooler weather. Weather.com said it would be in to 60s, but NO we brought California weather with us. This is why you see Nathan in white t-shirts the whole time because he packed long sleeve collared shirts that he couldn't wear. New York was exhausting, we got frustrated, our bodies ached, our feet blistered by the end of the trip, but all in all we enjoyed ourselves. 90 degree weather in April! No way, I'm so jealous. The year we lived there it was still FREEZING in April- like makes your jaw lock up and every bone in your body hurt, kind of freezing. I'm so jealous. 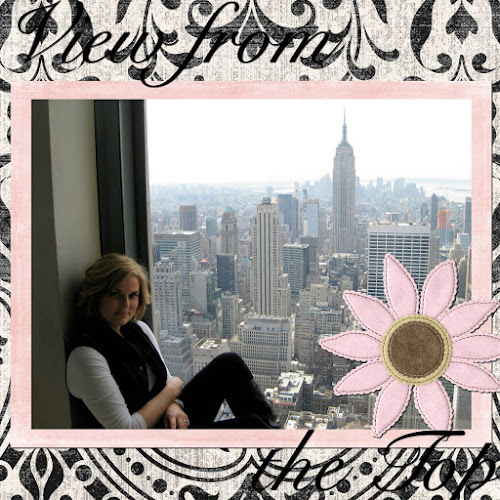 NYC is one of my favorite places ever. I miss living there and I think about it almost every day. You guys should have gone to Grimaldi's. It's in Brooklyn and is hands down the best pizza I have ever had. Patsy's on the upper east side is a close second. 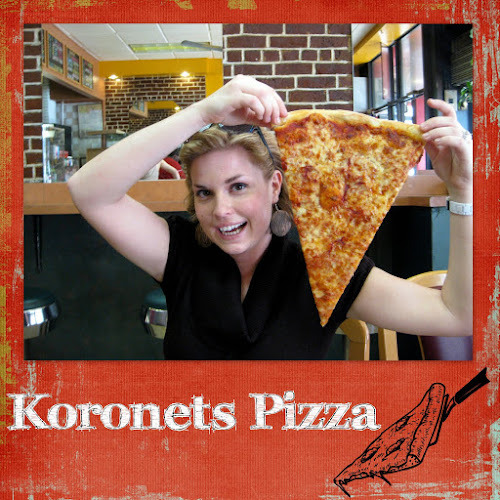 They both have superb dough, fresh slabs of home made mozzarella, and fresh veggies, etc. Keep those two on your list for next time. You guys packed a lot into just 4 days. 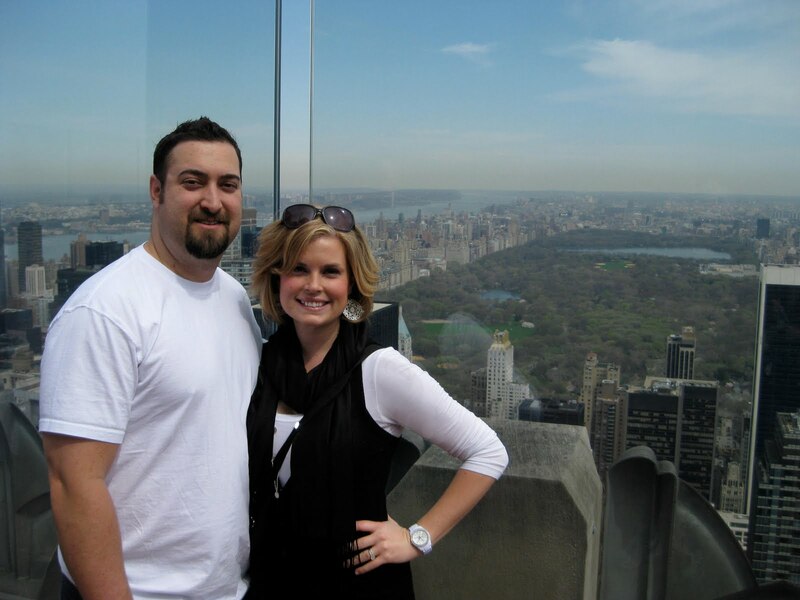 Your trip looks like it was a blast and made me miss the city even more than I do. It's good you had clear weather. You took some beautiful pictures. I like Nathans hair cut. You both look really good. Wow, what a trip. The pictures are gorgeous. I can't believe that cop just gave you tickets to the hockey game, that's awesome!